March 2015 – The Humanities Now! 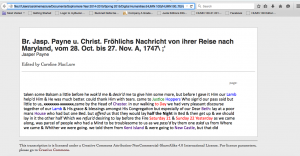 The process of tagging and marking up the Travel Journal of Christian Froehlich and Jasper Payne to Maryland and Virginia was a dissection process resulting in a deeper understanding of the text. Details that previously were not explicit became plainly clear through the decisions of our editorial board. These decisions were made as a group to establish consistency throughout the text. However, the team was unable to eliminate biases from our choices. As Elena Pierazzo said in her article, “A Rationale of Digital Documentary Editions,” “The process of selection is inevitably an interpretative act: what we choose to represent and what we do not depends either on the particular vision that we have of a particular manuscript or on practical constraints” (Pierazzo 465). Pierazzo emphasizes that the choices made by editors will influence the reader’s understanding of a piece. The travel journal, for example, is represented through the choices we made about what to classify in different ways. For example, our editorial board decided to categorize “Holy Spirit” under <persName type=”deity> (as shown in the below image). 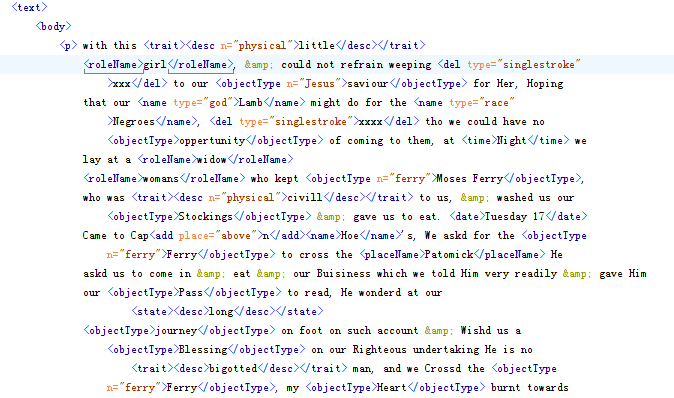 This is an excerpt of the marked-up XML file from page 7 of the Travel Journal. 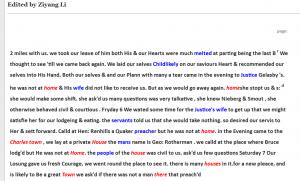 We discussed the option of making “Holy Spirit” and related words such as “Lamb” objects, however decided that persName made the most sense for this text. This decision, will impact the way that the readers ultimately come to interpret the text. In this way, as written by Pierazzo, “Perhaps then we should simply say that the notion of objectivity is not very productive or helpful in the case of transcription and subsequently of diplomatic editions” (Pierazzo 466). Had we been objective, very few tags would have been made and even fewer trends would be able to be detected by readers. 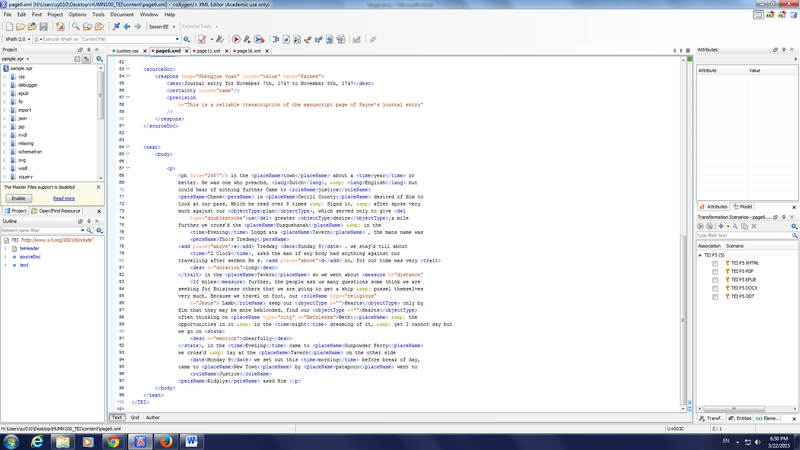 After tagging the XML files in Oxygen, we were able to link our content through a CSS file to make a webpage. Through the CSS file, we could manipulate the appearance of tagged words or the entire text– color, text style, and text weight were all variables we would alter. I made my decisions based on what I thought would be important for readers to gain out of the text. As stated by Pierazzo, “From the editors’ interpretation of the text and of the author(s) intentions it is necessary now to consider the readers of the edition and ask what must be added to the edition itself to satisfy their needs and expectations” (Pierazzo 470). In my answering of the question “What do the readers want/need to know from this text?” I thought back to both the purpose of the text and what readers would likely be using it for. As the text was written as a travel journal, I decided it was important to highlight the places the men traveled. I also determined that the people the men interacted with and the various roles of these people (Justice, Priest, Brother, etc.). 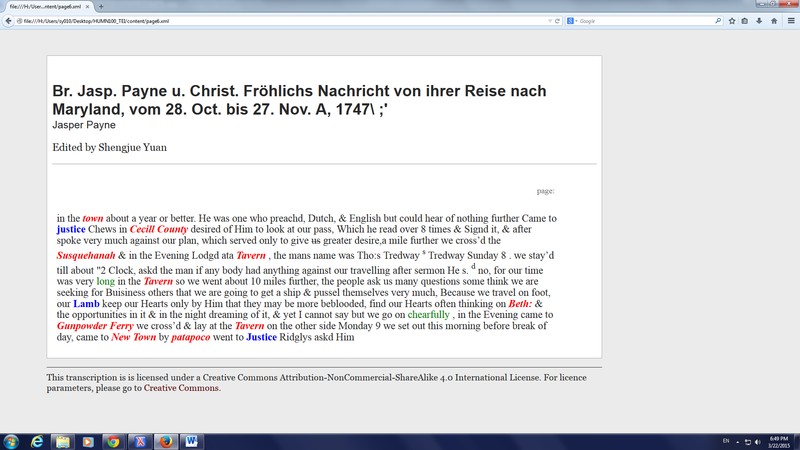 Above is an example page of the color-coded text. I also made the decision to italicize the words that were misspelled in the text. In order to make these things explicitly clear for the readers, I had the titles appear in green, the names of people appear in blue, and the places appear in purple (as shown to the left). 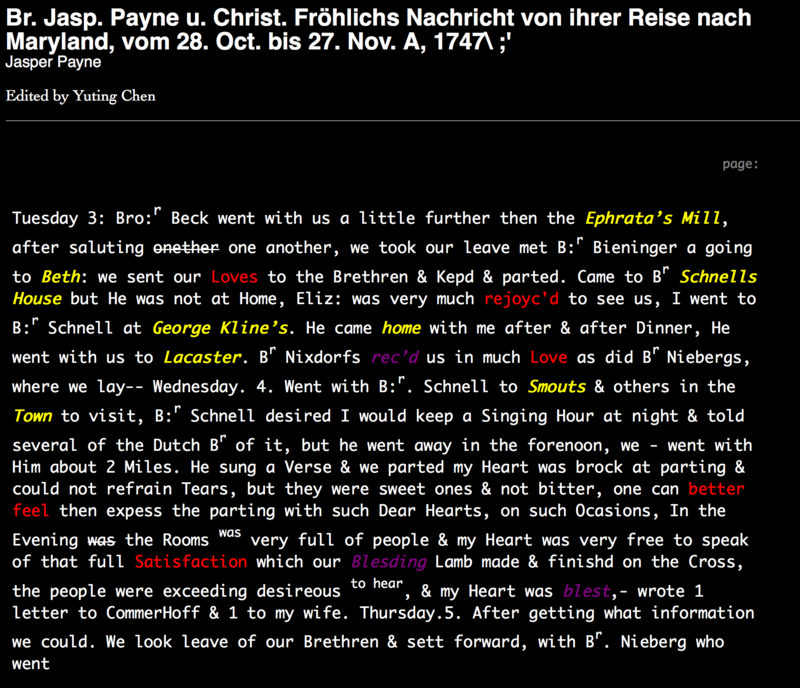 Color-coding the text allows readers to easily make connections between people and places. 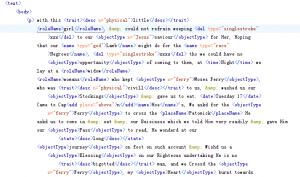 In addition, this was extremely helpful to find mistakes or untagged words; it can be difficult to find words to code in the XML format in Oxygen and this cleaner version made errors jump off the page. 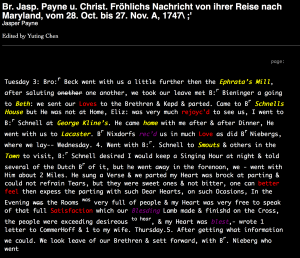 In the last month, we have come a long way with our analysis of Payne’s travel journal. We have gone from looking at very distant analyses of the text online to reading the text at a much closer distance that allowed us to create our own databases of the text. We started by marking up our transcriptions on Juxta Editions with the very basic categories such as people, places, and dates. 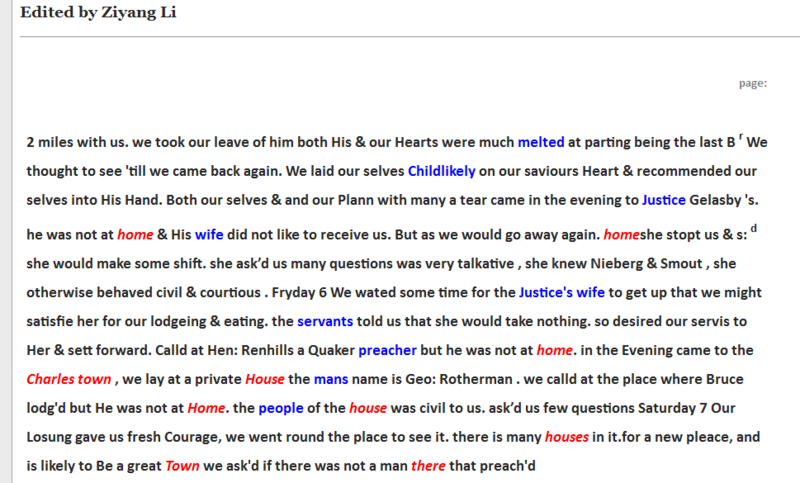 This was done with a few clicks of the mouse in Juxta. 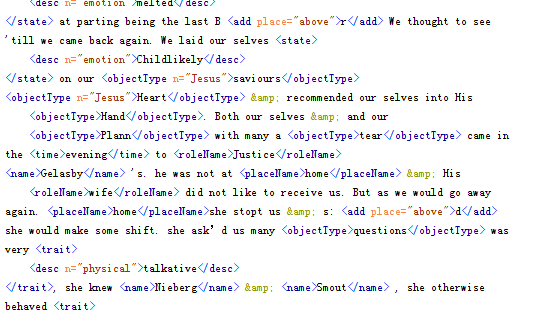 After this we moved on to <oXygen/> XML, which we used to mark the text up with more intricate tags. 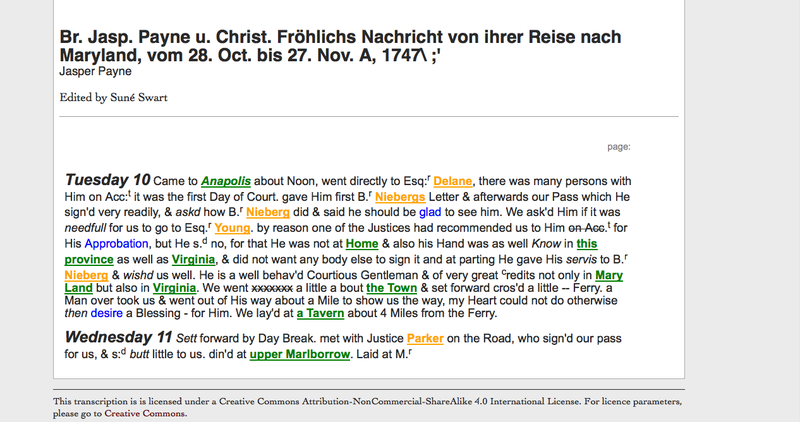 We downloaded our transcriptions from Juxta and imported them into <oXygen/>. 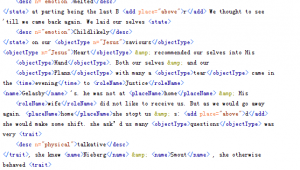 Immediately, the tags we added in Juxta showed up in <oXygen/> and we started to add tags for objects, emotions, misspellings, role names, events, and references to Jesus. 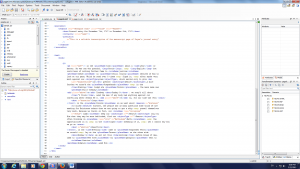 As Elena Pierazzo states in her article, “we need to rethink the reasons why we make our transcriptions.” We thought very deeply about what kind of words to tag. 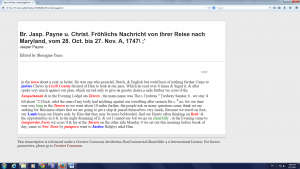 Doing this helped me understand how edited texts were produced and how distant reading can be done on texts using this. this made me realize that we could start by closely reading a text and collecting and organizing all of its data, which will then help others to distantly read our text. Opposite to distant reading, close reading places great emphasis on the single particular over the general, makes us paying close attention to individual words. 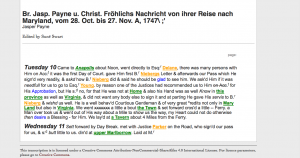 In the past few weeks, we did close reading from transcribing the Payne Journal in the Juxta Editions, learn TEL-compliant XML markup and use the Oxygen editor to markup the transcriptions. Also, we used these tools to publish the edition of Payne Journal on the web instead of in print. 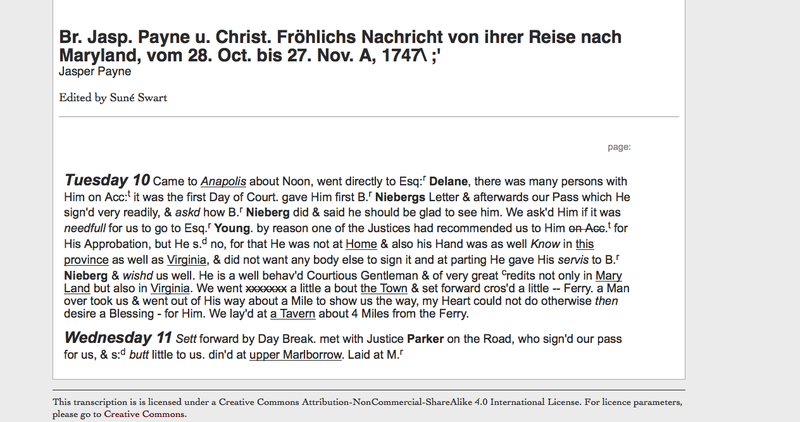 Juxta Editions allows us to compare the original documents and our transcription words by words. However, it only can do the subscription, simple tags of person, place and time on the transcription. In contrast, Oxygen helps us tag more parameters such as the event, object and trait. By marking up the parameters, I gained a different aspect understanding of the journal. The name of the place, the emotion of the role, and other contents in detail, which might be ignored by distance reading, was impressed in my head when I did the markup. I started to think about the relationship between the places, the emotion of the role and the event happened deeply. Now, let me talk more about my experience of using these tools to edit documents that published on the web with Elena Pierazzao’s article “ A Rationale of Digital Documentary Editions”. 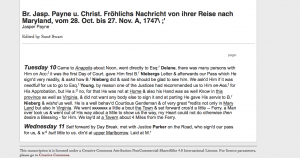 As Pierazzao stated that scholarly choices constitute the base of any transcription and subsequent diplomatic edition, when I was doing the markup, I have to make a choice on the source. There are potentially infinite sets of facts to be recorded and my goal is to edit as many of the characteristics of the journal as I can. Therefore, it is a challenge for me on how to choose, which features of the primary source I should reproduce, and where shall I stop? Pierazzao said that we must have limits on the selection based on the scholarly purpose. So, I decided to markup documents by choosing one category of parameters at one time. For example, based on the nature of the journal, I did markup for place name that I read through the entire page and only highlight all the place names. In that way, I can ensure all the parameters I need are reproduced while I will not mark mass useless words. Also, in order to ensure the uniform of our decision as an entire Journal, we created a Google document in class to share the editorial decision to we made. Another decisive challenge for editing is the design and style of the web. I chose white background with black text at the beginning, but after I thought about the comfortableness of the reader to read and search online for the best matched background, I changed the web to a black background with white text. Since this document is a travel journal, the places they traveled and the emotion of the role in the journal is important, I mark the color of the place names to yellow and emotion to red. I also changed the font style of the misspelling in case od readers’ misunderstanding.